At a time when many Europeans are looking inward after years of economic and political crises, the Greeks stand out as even more focused on their country’s own problems and as the most wary of global economic engagement. Of 10 European Union nations recently surveyed by Pew Research Center, Greeks are at the top of the list in saying their country should focus on domestic issues and are the most inclined to say their country should act unilaterally even when its allies disagree. More than eight-in-ten Greeks (83%) say their country should deal with its own problems and let other countries deal with their own problems as best they can. And 74% of Greeks say that in foreign policy, their country should follow its own national interests, even when its allies strongly disagree. 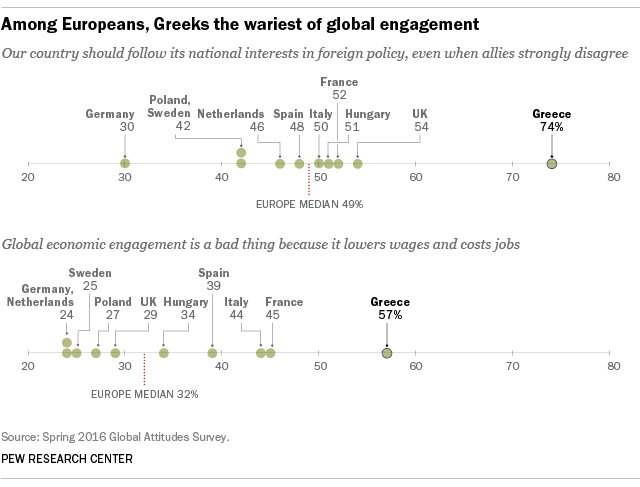 Greece is also the only EU country where a majority says global economic engagement is a bad thing because it lowers wages and costs jobs. By comparison, a median of 49% among the EU countries surveyed (including Greece) say their country should follow its own national interests first, and a median of just 32% say global economic engagement is a bad thing. The economic turmoil of the past eight years looms large in Greeks’ assessment of international threats. Most Europeans name the Islamic militant group in Iraq and Syria known as ISIS as the top threat to their country. But fully 95% of Greeks say global economic instability is a major threat, making Greece the only country we surveyed that does not see ISIS as its most severe threat. Greeks also differ from other Europeans in their evaluation of international institutions. Of the countries surveyed, Greeks have the least favorable views of the United Nations, the EU and the North Atlantic Treaty Organization (NATO). Roughly two-thirds of Europeans have a favorable view of the UN, compared with roughly four-in-ten Greeks (41%). Nearly six-in-ten Europeans (59%) view NATO favorably, compared with just a quarter of Greeks. And on the EU, 51% of Europeans view the institution favorably while only 27% of Greeks agree. In addition to holding the EU in low regard, Greeks are the most critical of EU policy on a range of issues. More than nine-in-ten Greeks disapprove of the EU’s handling of the refugee crisis and European economic issues. A median of more than seven-in-ten Europeans disapprove of the EU’s handling of refugees and a majority disapprove of its handling of economic issues, a far cry from the near universal disapproval in Greece. And while Greeks and Europeans alike disapprove of the EU’s handling of Russia, they disagree on how to deal with Russia. Fully 89% of Greeks say it is more important to have a strong economic relationship with Russia. But Europeans in general are much more divided: A median of 48% say it is more important to have a strong economic relationship with Russia, while 43% say it is more important to be tough with Russia on foreign policy disputes. This includes 71% of Swedes who prefer tough action against Russia on foreign policy disagreements.